The adorable, puppy-dog face of this squirrel drawing is hard to resist. The slight head-tilt gives it an inquisitive air, and those big shiny eyes are pleading "feed me, feed me!" Don't feed it, though. You'll end up with food on your shirt. And you wouldn't want to get food on such a nice shirt. 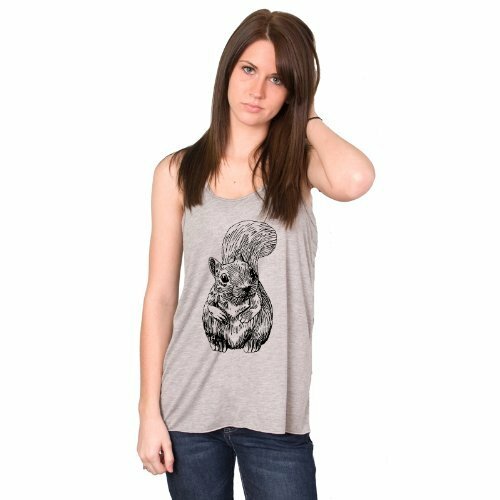 The "big squirrel in the middle of your shirt" theme is easy to get right. And this drawing is no exception. It's a boon that the curious squirrel is offered on so many styles. But it's a bust that no styles are offered for men, boys, or infants. Also available on tote bags.